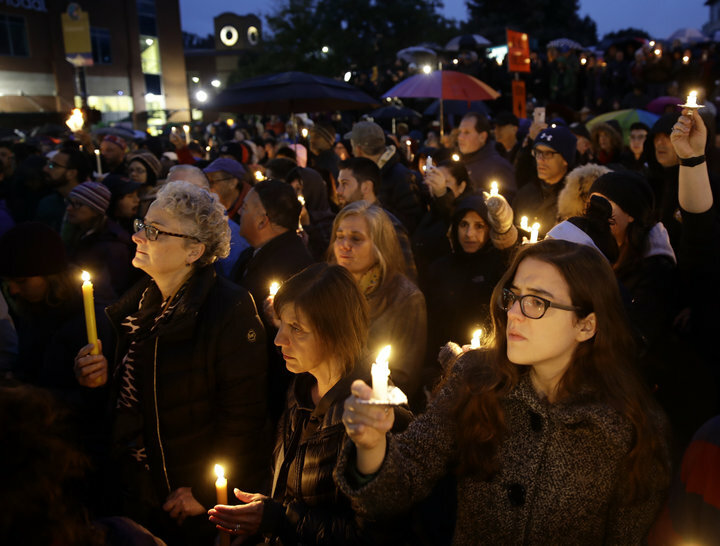 A candelight vigil near the Tree of Life synagogue in Pittsburgh following the shooting. Had this been a black-on-black shooting, it might have made the local news and then been used as a platform for various politicians and “community organizers” to milk some cash out of the local city government for their pet projects in an effort to further their careers. But no one outside of Pittsburgh would ever have heard about it. Had it been black-on-white, it might have made the local news and then been quickly memory-holed, because any discussion would have been uncomfortably tinged with racial overtones. Photographs of the suspect would very possibly not even have been released. If it had been an immigrant shooter, Fox News might have jumped on it and Republicans might have talked about it for a week or two, including the sending of a few masculine, rolled-up-sleeves tweets by a handful of politicians; but nothing substantive would have been done. But because this shooter was a white man and the victims were Jews – stop the presses! This is absolutely the most important thing happening in the United States of America! It is almost as if those assassination attempts on major political figures a few days before were not really assassination attempts after all, and everyone was starting to figure that out – or maybe Jews just matter more than everyone else in the country. Or, hell, why not both? Until recently, it was common sense to separate anecdotes and outliers from political policy and ideology. But in the age of the narrative, plot lines can be shaped with strategically-placed segments of decontextualized information. Millions of people can be trained to believe outright lies if presented by the right people, in the right way, at the right time. A photograph of a dead baby on a beach, if falsely exhibited as a Syrian refugee and spread endlessly across media platforms, can make mostly well-meaning but brainwashed whites tolerant of an unprecedented invasion of their countries by hostile foreign races. Crucial data which would otherwise be necessary in forming objective conclusions is simply ignored in order to facilitate one particular story arc. Or else one actual event amplified by the media will attain a significance that far outweighs any it actually deserves. Everyone can name a black person killed by a cop and beatified by the usual suspects even before the facts were in, but who can name more than a few whites who were killed by blacks, despite the number being exponentially higher? Everyone knows how many Jews were supposedly killed by Nazis during the Second World War, but how many know the number of American lives lost? I’m certainly not the first to ask these questions, but at times like this it is worth asking them again. We will be hearing about this shooting for years to come, but if my family were slaughtered tomorrow because we wandered into the brown part of town (perhaps to look at the ruins of what used to be beautiful buildings, or to see the vacant and decrepit old house that was once a family member’s childhood home in a happier, whiter America), you’d never know our names. And the elites really expect people to never ask why. These people, of course, know exactly what they are doing. The masses, however, are just following the commandments issued from the two poles of Jewish power in America: New York and Hollywood. The people who make up these unthinking masses will at the same time condemn White Nationalists for this shooting while claiming – supported by no evidence whatsoever – that nothing is actually happening to white farmers in South Africa (certainly nothing with any identifiable pattern). The same people who will ask you to disavow White Nationalism routinely ignore the staggeringly high levels of black-on-white violence in America and deny the atrocities committed against us daily by the mestizo invaders crossing our southern border. And these same people, when presented with the actual statistics (and after having had the concept of per capita explained to them), will say that it is “racist” to judge every person of a particular race by the actions of a few – just before they condemn whiteness, white privilege, white supremacy, and old white men. This shooting was unfortunate, but it changes nothing. There are bad people who believe good things and good people who believe bad things. Anyone who cannot wrap his head around such ambiguities is a simpleton who has been spiritually emasculated and probably needs remedial instruction. But more importantly, anyone who thought that a white population – most of whom cannot remember a time in which they were not reminded daily and viciously of their position as a race of malevolent creatures standing in the way of the liberation of all other living beings and the glorious activation of all forces for good in the universe – would simply sit back and not react at all to the loss of their habitat, their livelihoods, their hope for the future, their pride, and their sense of community and social order is either utterly delusional or deeply uneducated. I have experienced death enough times in my life to know the pain, emptiness, and bewilderment of sudden absence. It is not something that I cruelly desire for anyone. Indeed, this is in part why I am a White Nationalist. As Greg Johnson has pointed out numerous times, White Nationalism is the way towards a more peaceful world; it is globalism that wreaks havoc upon every land it touches and threatens to engulf what is left of the West in violence and misery. In my personal life, I am as empathetic as one can possibly be. I have even been accused on multiple occasions of being annoyingly supportive of the underdog – and from liberals, no less. And in this I suspect that I am not alone among White Nationalists. But the chances of these Jews caring one bit about me had I been killed by the consequences of those population replacement policies that their people have inflicted on my country are close to zero. Not that that would even matter, however. My ultimate concern is for my own people, and I don’t care what Jews think about a damned thing. We, not Jews – and certainly not American Jews – are under attack. And I am sick to death of the world’s most privileged people claiming to be underdogs in any context whatsoever. So, no, I will not shed a tear. No White Nationalist should feel the slightest desire to apologize, backtrack, disavow, or rethink a single thing he believes because of this event. Continue as if nothing happened. Call out our enemies at every turn, mock them for their hypocrisy, ridicule their insanely childish ideals, and throw statistics and blunt truths at them as usual – do everything but blink. Don’t give them an inch of moral ground. They have absolutely no right to take it. To prevent further incidents like this shooting, and all the other horrible things that have already needlessly occured due to the unnatural social arrangements forced upon us – and indeed others all around the world – by hostile globalist elites, White Nationalism should not be condemned, but embraced. As I write this, it is too early to tell exactly where he fits on the ideological spectrum of the Right, and frankly, I don’t care.